The Johor Society For The Performing Arts (JSPA) has organised a comeback of their theatre-musical production Bumi Berlantai Permata (The Bejeweled Land), first staged back in between 2009 to 2012, to this coming 20th to 23rd March at the Persada Johor International Convention Centre as a part of His Majesty, the Sultan of Johor’s 2019 Birthday Celebrations. His Majesty would be attending the grand finale of the play on 23rd March, 2019. The Bejeweled Land, written by Rahimah Muda, directed by seasoned local theatre director, Sahruddin Manas and co-produced by JSPA with Alpha industrial Consult. 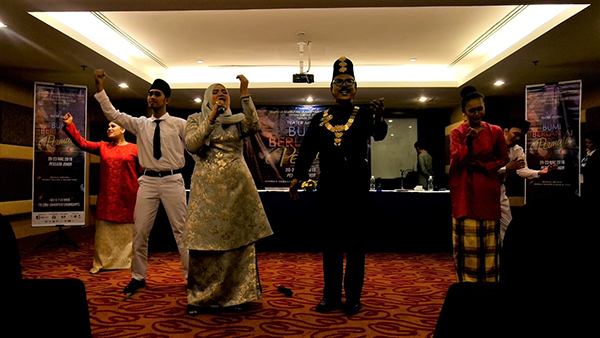 The musical tells the history of Johor and how Bangsa Johor was formed. “Accuracy of the slangs used in Johor during the 18th century and the historical facts presented were thoroughly checked and audited by Yayasan Warisan Johor”, said Suzie Yap to the media. Director Sahruddin promises a show that will be enjoyable from the beginning to the end ala-Broadway while Fauzi Ahmad as the main actor and co-director added that the play is 100% locally produced to maintain the Johorean spirit. Subtitles in English and Mandarin are prepared on screen to reach beyond the Malay speakers’ audience. Duration of the show is for about 90 minutes and the total number of performances would be 6, involving 2 matinee shows for the first two days at 3:30pm and four night shows running from 20th to 23rd March. Tickets range from RM10/pax for students and RM30/pax for adults. VIP’s tickets are priced at RM100/pax and VVIP’s are RM250/pax for the final two days. Half of all proceeds from the VIP and VVIP ticket purchase will go to Malaysian Red Crescent Society National Committee For Community Services.